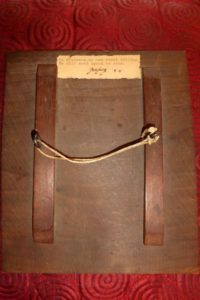 I was recently contacted by Kathryn Shapland in Australia who had some memorabilia relating to Godfrey Hine – the son of Edith Heath, of Leigh, and William Egerton Hine. (See articles of Jan-May 2018 and our website). Kathryn and her husband run a museum from their farm on the south coast of Western Australia which is called Recollections of War where they display items and tell stories. For further interest are two links to articles done by their local ABC channel which gives an idea of what they collect. One of the groupings that they have on display belonged to World War 1 soldier, Godfrey Valentine Brooke Hine. 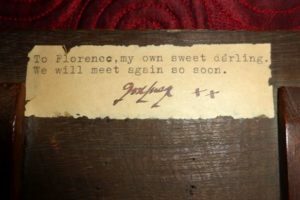 They have a wooden plaque/etching made by Godfrey for his sweetheart Florence prior to going to war and a framed photo of him with a contemporary write-up on the reverse, explaining what happened to him. They had bought the Hine grouping in 2014 through eBay in Australia. The man from whom they bought these items believed he had bought the grouping in Australia and not the UK and it could have been that Godfrey’s older brother had come to Australia before going to farm in Kenya – which might be how the items came to be in Australia. The Shaplands recently came to England and visited St Mary’s to look at the Hine Memorial window. Unfortunately the Historical Society did not know about the visit at the time so did not have an opportunity to meet them. To confuse the reading of this article, however, towards the end of the item Prof Durey uses the name Hale instead of Hine – rather disconcerting. A copy of this article is also in the Leigh Historical Society archives. 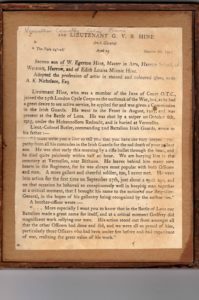 This prompted me to look a little more into Godfrey Hine – the Heath and Hine family – and it is all particularly relevant in these years when we have been commemorating the sacrifices made in the First World War. Godfrey Hine was the third son of William Egerton Hine and Edith Louise Minnie Heath. He had an older half brother, Frank Croft Kingsley Hine, son of Lilian Croft, and another brother, Alfred Gordon Hine, plus two younger sisters. He was born in 1890 and baptised on 6 July 1890 at Reigate. He was born into an artistic family – his mother, Edith, was an artist and sculptress (LINK) and his father was a painter of landscapes who also taught art at Harrow School. Many of William Egerton Hine’s siblings were artists and his father was Henry George Hine, a well-known landscape artist in his day. Godfrey attended Harrow and then went on to follow in the family footsteps with a career in the arts – the art of stained glass painting under the tutelage of Archibald Keightley Nicholson. [i] The 1911 census describes Godfrey as an art student. Archibald Keightley Nicholson had established himself as a maker of ecclesiastical stained glass and worked within the Arts and Crafts tradition which used handicraft methods of production rather than the division of labour methods employed by the more commercial firms supplying stained glass. The window in the north transept of Leigh Church was installed in memory of Agnes Maria Heath – Godfrey’s grandmother who had died in 1912. The figures are of St John and St James – copied from those in Winchester College Chapel. Godfrey, at that time employed in the studio of Archibald Nicholson, carried out the work in memory of his grandparents and used the Winchester window as his model but inserted the family coat of arms at the foot. The window shows the Heath coat of arms “a chevron sable between three moorcocks on an ermine ground” surmounted by the Heath crest of a tower argent flambant proper and the motto ‘hanc fenestram donum dedit Agnes Maria Heath in deo laudem. [ii] However, he did not sign the work and his technique is not yet as refined as that of his mentor. Godfrey was also interested in military affairs and as early as 1908 had joined the Inns of Court Officer Training Corps as a Private and when war broke out, he enlisted. 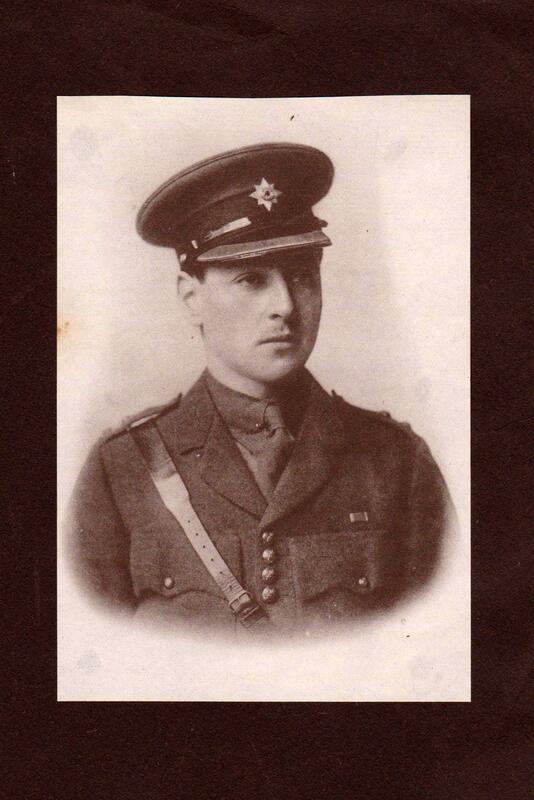 He was eventually gazetted as 2nd Lieutenant in the Irish Guards in May 1915. One of his new colleagues would be John Kipling, son of Rudyard Kipling: they would both die at the Battle of Loos, Kipling 9 days before Godfrey, who was himself killed on 6 October 1915, aged just 25. Godfrey’s cousin – first cousin, once removed in fact (see Heath family tree), Lt. Col. Maurice Gordon Heath of the Queen’s Royal West Surrey Regiment, also died at Loos, but on 25 October 1915 and he is commemorated on the Loos memorial. 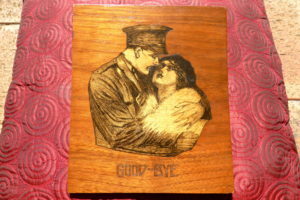 When Godfrey enlisted he was initially attached to the Reserve Battalion. But in July 1915 it was decided to form a Guards Division. A second battalion of Irish Guards was established and Godfrey was one of the original officers when the battalion left Southampton for Havre on 8 August 1915. They met their sister battalion at St Pierre, about 10 kilometres west of St Omer at the end of August and began training in the Lumbres area. Preparations were already being made for a major battle around Loos. They were to attack in conjunction with the French just to the south and in Champagne. It was to be the BEF’s largest effort in the war so far and there were hopes that it would lead to a breakthrough. The Guards, under the command of Sir John French, were not ordered on to the battlefield until 27 September. This was two days after the 1st Army had initially attacked and when the offensive had bogged down. The 2nd Guards Brigade attacked at 4pm under orders to capture Chalk Pit Wood and the mine workings called Puits 14 Bis on the Lens-La Bassée Road. The gains initially made were retained mainly due to Captain Harold Alexander, the future Field Marshal, who held on to trenches beyond the wood until reinforcements arrived. According to Rudyard Kipling, in achieving that objective he was assisted by Hine who ‘distinguished himself’ that day. The 2nd Irish Guards were relieved on 30 September but on 3 October moved to trenches at Vermelles. This was their first tour of normal trench duty and their inexperience was to have fatal consequences. Early morning of 6 October at first light ‘while No. 3 Company was settling into battalion reserve trenches, 2nd (sic) Lieutenant Hine exposed himself over the parapet and was shot through the head and died almost immediately’. 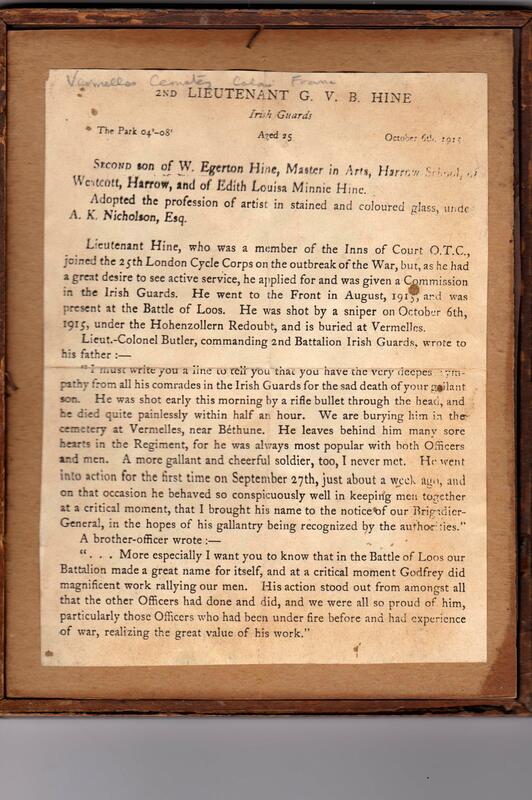 A failure to appreciate the dangers of trench warfare may have been a major factor in Hine’s unfortunate and unnecessary death, but contributory reasons were his ‘natural fearlessness’ and his utter conviction ‘that he would not be killed in the war’. Godfrey’s service papers do not survive but his parents would have been informed quickly after the event. They would also have been informed officially that Godfrey had been buried at Vermelles British Cemetery – they subsequently had engraved on his headstone: Inseparable from God. The newspaper articles of 9 April 1920 report on the dedication and unveiling of the window and also describe it in some detail[iv] – St Patrick wears full Episcopal vestments and holds the pastoral staff, with two angels above holding the shield of Ireland. In the right light, St George, wearing full Gothic armour and holds a banner with the Red Cross. On the shield above are the leopards of England, the first quarter of the Royal Arms, as the Harp is the third quarter above St Patrick. On the left is Joan of Arc for France. St Joan and St George ‘suggests the alliance that has been brought about between the two leaders of the Latin and Saxon races, an alliance welded in the fires of war.’ According to the articles, the costume in which Joan is represented ‘is absolutely historically correct, for there is a full description of her appearance when captured, which was given by one of the witnesses who saw her capture and described her in the trial’. In the tracery lights are the Martyrdom of Joan and the Victory of St George. The connection of these two subjects with the whole idea of the window scheme is obvious. Kathryn Shapland wrote that the thing she found most moving about Godfrey’s story is the inscription on the wood engraving – “Goodbye” on the front and the dedication to his “own sweet darling Florence” on the back. Godfrey was described as fearless and utterly convinced that he would survive the war. Her feeling is that he made his pledge to Florence and expected to keep it. Unfortunately, this was a sentiment expressed my many of the enthusiastic young men who left our shores for war and never returned. And many sweethearts were left behind and alone, many never to marry. [i] Notes about Archibald Keightley Nicholson come from an article by Professor Michael Durey and also from Wikipedia. Examples of Nicholson’s works can be found via the internet with their location. At the time of the Hine memorial, Nicholson was working from his studio at 105 Gower Street. During his lifetime he is said to have produced 700 works, not just memorial windows such as ours at Leigh but also works for many cathedrals – for the Lady Chapel of Waltham Abbey Church which has three windows by him – the Edward Elgar Memorial Window at Worcester – and windows at Newcastle, Chester, Lincoln cathedrals among others. The full article by Prof Durey on Godfrey Hine and his involvement in the Great War can be found at: www.greatwarbritishofficers.com/index_htm_files/Hine.Godfrey.pdf. [ii] Lawrence Biddle ‘Leigh in Kent 1550-1900’ p. 108 refers erroneously to Godfrey Hine being employed by William Nicholson. He also says that the window was in memory of his grandparents – however Albert Hodsoll Heath’s name is not mentioned on the window only Agnes Mary. [iii] Lawrence Biddle ‘Leigh in Kent 1550-1900’ p. 108 states that the Hine Window was designed by William Nicholson. This is incorrect. [iv] Sevenoaks Chronicle and Kentish Advertiser/Kent & Sussex Courier both of 9 April 1920 describe the dedication and unveiling of the Memorial Window.